SOLD! ----- One level living in desirable Crown Point! Abbotsford's most popular gated community boasting 1,745 sq ft with newer flooring and kitchen counters. 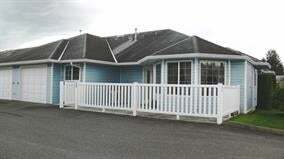 2 large bedrooms, 2 full baths. This end unit has a private backyard with visitor parking right outside your door. Very active clubhouse with games room, kitchen and large workshop. 55+ please. Yes to a small pet.